Yusuke is a stereotypical rebellious teenager. He constantly cuts class, disrespects his teachers (and everybody else for that matter), and most of all, picks fights with anyone and everyone that crosses him. But despite his bad boy reputation, he is extremely compassionate towards people he truly cares about, especially his girlfriend Kayko. Overall, Yusuke's character is very complex, ambiguous, and on the whole nearly impossible to define. 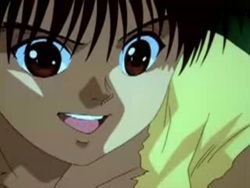 But above all, Yusuke is resilient and extremely strong, which, often times, proves to be his downfall.